According to the bean counters at Ernst and Young, the United States has one of the highest capital gains tax rates in the world. But if you don’t trust the numbers from a big accounting firm, then you can peruse a study from the pro-tax Organization for Economic Cooperation and Development that reaches the same conclusion. But does this really matter? Is the United States harmed by having a high tax rate? The Wall Street Journal certainly makes a compelling case that high tax rates on capital gains are self-destructive. And this remarkable chart shows that workers are victimized when there is less investment. Let’s add to all this evidence. Jason Clemens, Charles Lammam, and Matthew Lo have produced a thorough study for the Fraser Institute about the economic impact of capital gains taxation. A capital gain (or loss) generally refers to the price of an asset when it is sold compared to its original purchase price. A capital gain occurs if the value of the asset at the time of sale is greater than the initial purchase price. …Capital gains taxes, of course, raise revenues for government but they do so with considerable economic costs. Capital gains taxes impose costs on the economy because they reduce returns on investment and thereby distort decision making by individuals and businesses. This can have a substantial impact on the reallocation of capital, the available stock of capital, and the level of entrepreneurship. Capital gains are taxed on a realization basis. This means that the tax is only imposed when an investor opts to withdraw his or her investment from the market and realize the capital gain. One of the most significant economic effects is the incentive this creates for owners of capital to retain their current investments even if more profitable and productive opportunities are available. Economists refer to this result as the “lock-in” effect. Capital that is locked into suboptimal investments and not reallocated to more profitable opportunities hinders economic output. …Peter Kugler and Carlos Lenz (2001)…examined the experience of regional governments (“cantons”) in Switzerland that eliminated their capital gains taxes. The authors’ statistical analysis showed that the elimination of capital gains taxes had a positive and economically significant effect on the long-term level of real income in seven of the eight cantons studied. Specifically, the increase in the long-term level of real income ranged between 1.1 percent and 3.0 percent, meaning that the size of the economy was 1 percent to 3 percent larger due to the elimination of capital gains taxes. Then the authors analyze the impact of capital gains taxes on the “user cost” of capital investment. Capital gains taxes make capital investments more expensive and therefore less investment occurs. …Several studies have investigated the link between the supply and cost of venture capital financing and capital gains taxation, and found theoretical and empirical evidence suggesting a direct causality between a lower tax rate and a greater supply of venture capital. …Kevin Milligan, Jack Mintz, and Thomas Wilson (1999) sought to estimate the sensitivity of investment to changes in the user cost of capital…and found that decreasing capital gains taxes by 4.0 percentage points leads to a 1.0 to 2.0 percent increase in investment. Next, they investigate the impact on entrepreneurship. Capital gains taxes reduce the return that entrepreneurs and investors receive from the sale of a business. This diminishes the reward for entrepreneurial risk-taking and reduces the number of entrepreneurs and the investors that support them. The result is lower levels of economic growth and job creation. …Analysing the stock of venture capital and tax rates on capital gains from 1972 to 1994, Gompers and Lerner found that a one percentage point increase in the rate of the capital gains tax was associated with a 3.8 percent reduction in venture capital funding. Last but not least, the authors also discuss the impact of capital gains taxation on compliance costs, administrative costs, and tax avoidance. They also look at the marginal efficiency cost of capital gains taxation and report on some of the research in that area. Dale Jorgensen and Kun-Young Yun (1991)…estimate the marginal efficiency costs of select US taxes and find that capital-based taxes (such as capital gains taxes) impose a marginal cost of $0.92 for one additional dollar of revenue compared to $0.26 for consumption taxes. …Baylor and Beausejour find that a $1 decrease in personal income taxes on capital (such as capital gains, dividends, and interest income) increases society’s well-being by $1.30; by comparison, a similar decrease in consumption taxes only produces a $0.10 benefit. …the Quebec government’s Ministry of Finance…found that a reduction in capital gains taxes yields more economic benefits than a reduction in other types of taxes such as sales taxes. 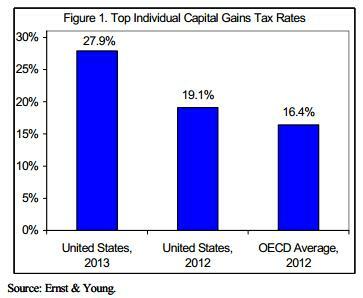 Reducing the capital gains tax by $1 would yield a $1.21 increase in the GDP. Here’s my video on the topic, which explains that the right capital gains tax rate is zero. The bottom line is that the United States is shooting itself in the foot. Or, to be more accurate, politicians are hobbling America’s productive sector and undermining U.S. competitiveness with senseless class-warfare taxation. And don’t forget that the United States compounds the damage with the world’s highest corporate tax rate, pervasive double taxation of dividends, and a punitive death tax. So while some countries are doing the right thing and abolishing their capital gains taxes, the United States is languishing in the international contest for more investment. The only “good news” is that a few other nations also impose foolish policies as well. P.S. 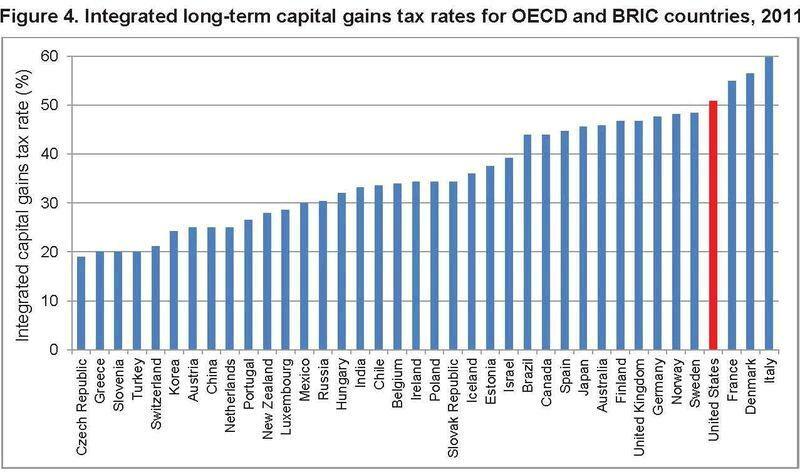 It’s worth noting that all good tax reforms, such as the flat tax, completely abolish the capital gains tax. P.P.S. This is yet another example of first-rate research from the Fraser Institute. They’re the publishers of Economic Freedom of the World, as well as some excellent research on the harmful impact of excessive government spending. The case that liberals make about the elimination of the capital gains tax as being a handout to the wealthy is absurd. Taxation of Capital Gains is economically devastating. Every dollar gets double taxed. If you tax 20% of future gains, stock will be valued at 80% of its untaxed potential; since the investor gets 80% and the government 20%. While this is not a big issue for outstanding stock, it is a huge issue for new and growing companies, in that they must issue 25% more stock to bring in the same dollar amount. Do we really want to retard the growth of our fastest growing companies? The point of taxation is this: Government = Good; Capitalism = Evil. For a long time, our SOCIALIST model of taxation, (often referred to as “PROGRESSIVE TAXATION’), is to punish and burden Capitalism and the fruits of all who benefit from it. On the basis of Capitalism = Evil, the increase of all taxation is therefor justified. Unless We The People recognize this permanent serfdom upon us all, the evils of excessive and increasing taxation will continue to be imposed upon us all. A very significant point is that the tax is levied not only on actual gain, but also the increase due to inflation. I purchased an investment house in 1983 for $225K and sold it in the recent depressed real estate market for $425K – much less than what I paid for it after adjusting for inflation. The sale resulted in a $100K capital gains tax bill! And it triggered the AMT rules so that all my other income for that year was taxed at exorbitant rates. The government walked off with half my life savings. Invest you money, engage in delayed gratification, which gives other people the resources to create more economic activity and thus more and higher value/pay jobs? Naaa, just buy a Porshe. Life is short, enjoy it. You save, you get double and triple taxed, the fed suppresses your investment return and may even end up paying inheritance taxes. So do buy that Porsche. How we shoot ourselves in the foot through the punitive taxation of capital gains. In the end, it hurts working people.